Size of Male: 8-10 lbs., 10-12.5 in. Size of Female: 8-10 lbs., 10-12.5 in. Labeled the king of toys, the Miniature Pinscher looks a lot like your small Doberman but it is actually the older breed. 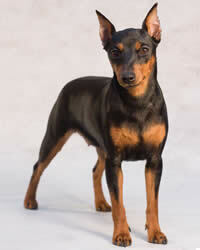 The “min pins,” as they are known, are captivating escape artists: energetic, feisty, smart and willful. Among other things, the dog loves to bark and snuggle. If you wish to keep a small energetic dog that thinks highly of itself, the Miniature Pinscher is guaranteed to delight and surprise you. In German, “Pinscher” stands for “biter.” These hunters descended from the bloodlines of an Italian Greyhound, a Dachshund and a Terrier. You’ll see some similarities when you pay attention to how the min pin looks and behaves. The breed is depicted in 17th-century artwork as the dog that had the size of a cat. This fascination for the dog’s tiny size led to breeding experiments that failed miserably in the 18th century. Luckily, when the shift from small size to elegant looks was made, the breed you see today began its rise to fame. Min pins are hyperactive and bold. They want to be on the go all the time. The only exception is when they’re demanding to cuddle with you. They tend to act dominantly over other animals and get a thrill chasing smaller creatures like rats and rabbits. Give this pooch some stuffed toys, and the dog is guaranteed to shred each one easily like paper. Living Environment – Due to its small size, this toy dog breed is not uncommon as an apartment dog, but does best in a home with a fenced yard. The latter is recommended unless you wish to deal with complaints about your pet’s incessant barking. They also have a propensity to chew things left lying on the floor. In terms of climate, the cold is not for the min pin. You may want to reconsider maxing out your air conditioner too; your canine friend just can’t tolerate this. Grooming – Coat care for this energetic breed is very minimal. Occasional wet wiping will help them stay sleek. Daily brushing is unnecessary. This dog breed can even serve as a constant companion to most allergy sufferers without triggering their asthma attacks. Diet & Exercise – Puppies can indulge in 3 to 4 feedings a day, but the adult min pin is typically fed only once a day. There is a long list of food items that you should avoid giving this breed: chicken, lamb and pork, to name some. To calculate the ideal serving size, you simply need to allocate one-half ounce of food for each pound of body weight. The breed is a ball of energy. It wants to romp around, play and chase things. Fortunately, its exercise needs can be met both indoors and outdoors. A walk a day isn’t always enough for the energetic min pin. You’ll need to schedule a series of activities to keep the dog happy. Health – Overall, Miniature Pinschers are sturdy fellows though some may test positive for cataracts, epilepsy and thyroid problems. Do not take vet visits for granted even though your min pin is robust. Knee tests and eye tests are suggested. Their intelligence makes the min pins a stubborn breed. They are notoriously hard to control and housetraining a puppy can be quite a challenge. A novice pet owner is free to take the Miniature Pinschers in, but the veteran pet owner sports a far better chance with dog training.